Thanks to the vision and the leadership of the National Center on Deafness, CSUN’s program is one of the largest of its kind in the western United States and a model of excellence regionally, nationally and internationally. 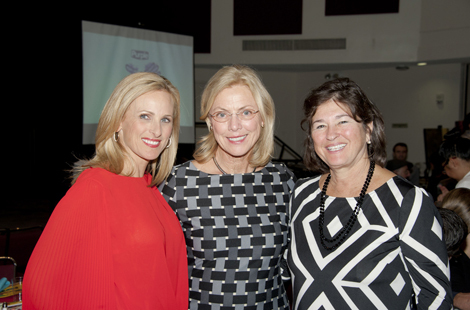 The 50th anniversary celebration culminated in a recent gala that drew luminaries such as Academy award-winning actress Marlee Matlin, pictured above on the left. Read more about the NCOD. CSUN President Dianne F. Harrison joined President Obama, the First Lady and other higher education leaders to announce new actions to help more students prepare for and graduate from college. Read more about event. Four extraordinary faculty and staff members at CSUN received the Don Dorsey Excellence in Mentoring Award for going above and beyond their jobs to serve students in any way possible. Read more about the mentors. Sun., Dec. 14, 7:30 p.m. Sat., Dec. 20, 7 p.m.
For Your Information this week features information on opportunities for women in leadership, a workshop to help individuals deal with holiday stress, and tips on how to avoid slips, trips and falls. A variety of CSUN gear is again available at the Northridge Fashion Center, just in time for holiday shopping. This year’s Faculty Retreat will focus on sharing research and expertise across diverse arenas in education, including innovative and creative teaching, promotion of civic engagement and innovation in information literacy.